THE ROTHSCHILDS JEWISH MAFIA (RJM) PLAN TO DOMINATE AMERICAN LIFE BEGAN IN EARLY 1900s | Concise Politics -- Your Time should NOT be wasted. RJM needed a pawn in the White House to implement their Zionist plan. Mafia funded Wilson’s run for Democratic governor of New Jersey = Schiff + Warburg + Henry Morgenthau, Sr. = Won New Jersey’s Governor in 1911. Rabbi Wise = Autobiography, “Challenging Years” = Boasted he was a Mafia Agent to “an immensely influential hidden power” that “had chosen Wilson as a major pawn in their political game” = Before Wilson was President of Princeton University. Wilson’s image vand clever language CAMOUFLAGED the Mafia Goal of centralized Power = 1913 Pushed through Mafia central bank “Federal Reserve Bank.” = Wilson on Dec 19, 1913 pushed the bill through the Senate while most members were home for Christmas. 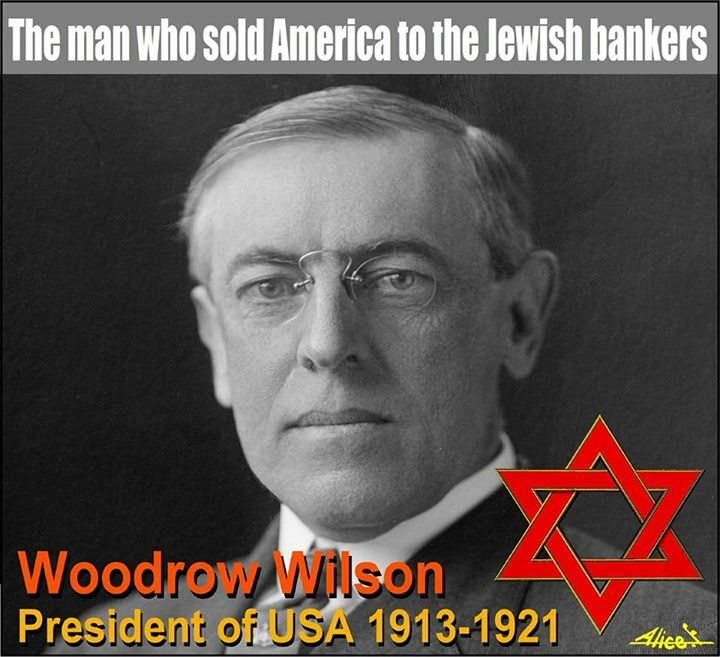 WILSON = MAFIA AGENT for “Lord” Nathaniel Rothschild = Put American Monetary Resources in the hands of three MAFIA AGENTS = Jacob Schiff of Kuhn, Loeb Bank + Paul Warburg, Fed’s first chairman + George Blumenthal, a high official of JP Morgan. = “Treasury” of U.S. forever be in ROTHSCHILDS JEWISH MAFIA HANDS. FEDEAR RESERVE = Private Rothschilds Mafia run bank that was neither “Federal” nor with any “reserves” = GIVEN AWAY TO CRIMINAL AGENTS BY Washington thanks their AGENT WOODROW WILSON = BIGGEST SCAM IN THE WORLD = Money out of thin air with no hard currency backing and withn USURY INTEREST CHARGED TO AMERICANS through the NEW INCOME TAX to pay THE JEWISH LOAN SHARK MAFIA for use of American backed paper money. This entry was posted in THE ROTHSCHILDS JEWISH MAFIA (RJM) PLAN TO DOMINATE AMERICAN LIFE BEGAN IN EARLY 1900s and tagged THE ROTHSCHILDS JEWISH MAFIA (RJM) PLAN TO DOMINATE AMERICAN LIFE BEGAN IN EARLY 1900s. Bookmark the permalink.